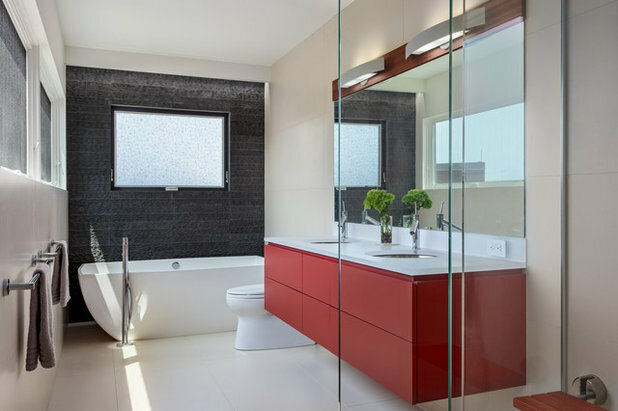 Bathrooms are often white with perhaps an element or two in a neutral tone, but many of us never consider incorporating colour into this most functional of spaces. We should, though, because a splash of a bold shade can add personality and interest, lifting a plain scheme out of the ordinary. To keep it classy, choose just one strong hue and surround it with plenty of crisp white or a very pale neutral. 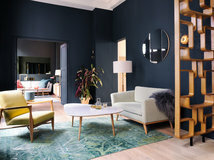 A great way to add colour is through furniture. It’s less of a commitment than a bright bath or vibrant taps, and also adds storage – something we all welcome. 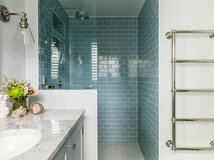 So, whether you go pastel or primary, consider giving your bathroom a refreshing colour boost with these ideas. 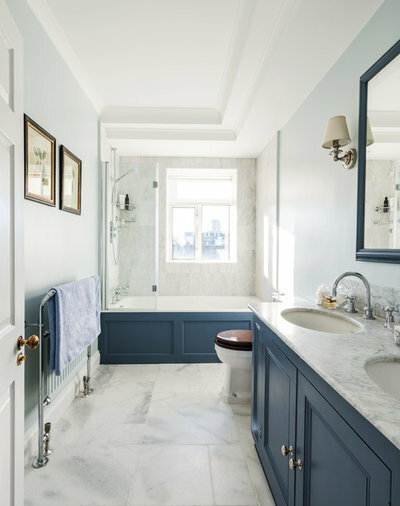 On-trend French navy works beautifully in a bathroom, especially teamed with marble. 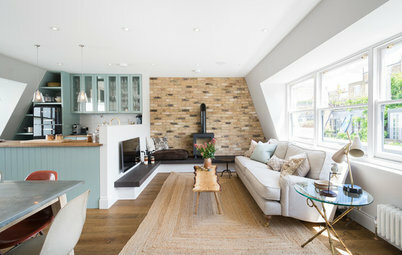 In this room, it acts as a quiet partner to the luxurious stone, grounding the scheme and giving it strength, so it doesn’t look wishy-washy. 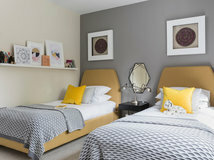 If you paint with this colour, go eggshell or matt – a gloss finish would be too shiny for this graceful look. 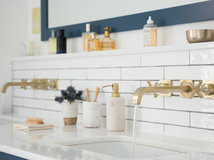 Chrome fittings look smart with this colour, or try brass for a modern take. 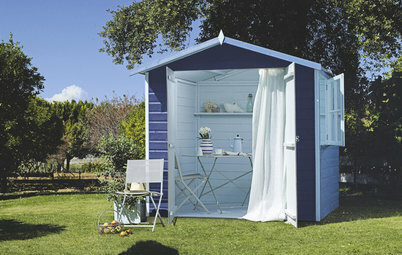 A large bathroom storage unit is a bonus to many people, stashing toiletries, loo rolls and towels neatly out of sight. If you’re having trouble finding something that captures your style, consider upcycling a vintage kitchen unit with a smart paint colour instead. Embrace the design and make it a feature. 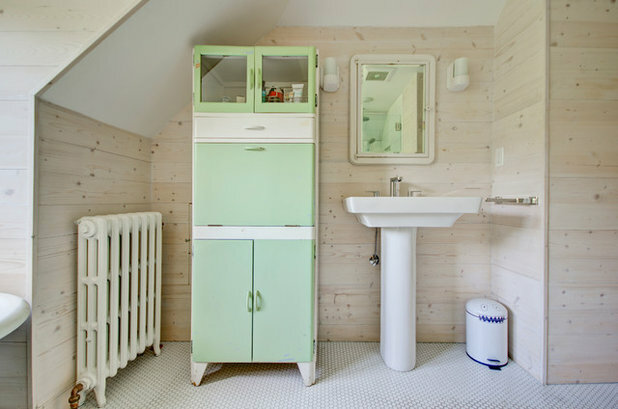 Here, soft mint green paint boosts the retro vibe of this cabinet and immediately gives the simple bathroom lots of personality. 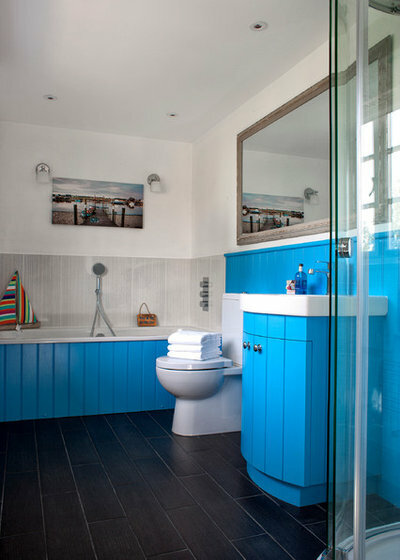 Bright blue is a cheerful, coastal-style colour choice. 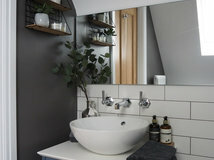 You can update painted woodwork, like this tongue-and-groove bath panel and vanity unit, in a weekend. Rub down old paintwork with sandpaper and wipe clean before recoating with fresh paint. Make sure you use paint that will withstand water splashes and repeated wiping – an oil-based (rather than water-based) paint in either gloss, satinwood or eggshell will work well. 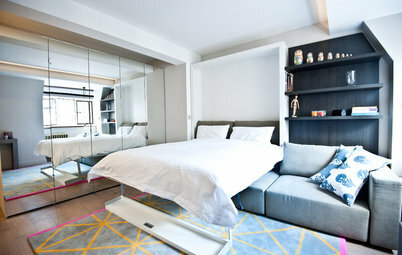 These sleek, leafy green, wall-hung units offer lots of storage without compromising on contemporary style. 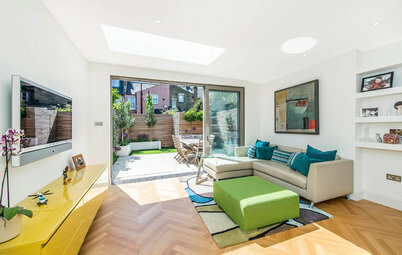 The colour is easy on the eye and the curved styling and smooth doors look smart. The carefully chosen mirror above echoes the curved detail. Green and white is a crisp and natural combination that always feels fresh. Enhance the natural mood further with bamboo accessories, brown glass bottles and living plants for spa style. 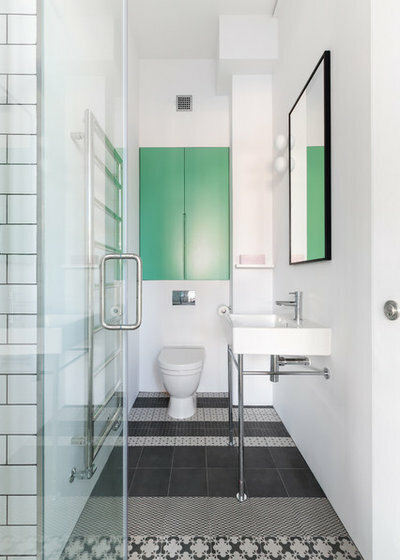 A brightly coloured cabinet on the end wall of this narrow bathroom makes the room look as big as possible by drawing the eye to the furthest point. Contrasting floor tiles work together for a stylish combination that looks well thought out and interesting. This cabinet has a super-smooth finish, but you could equally find a cupboard in a second-hand shop and simply paint it in the colour of your choice. Just make sure you sand it down and fill any indentations first. 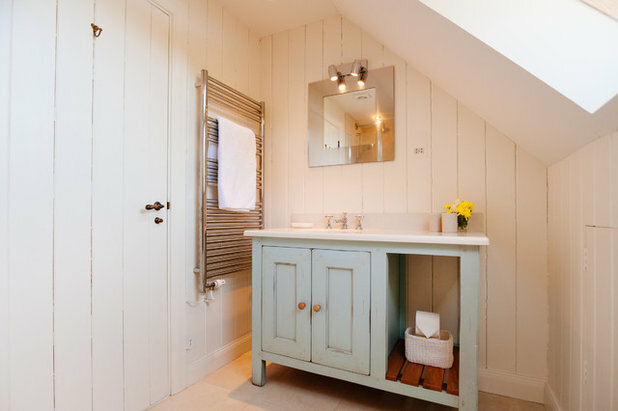 Duck-egg blue brings immediate country style to a cottage bathroom. This rustic vanity unit with a distressed finish is timeless and, when teamed with cream décor, creates the perfect relaxed mood. As this is such a pale shade, keep the rest of the room and your accessories light, introducing interest through textures such as woven baskets and natural wood. 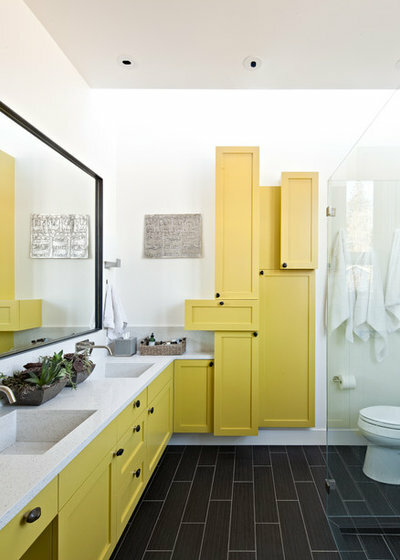 A mix of different cupboards, all in the same soft yellow, make this bathroom both memorable and practical, with storage nooks for individual items. 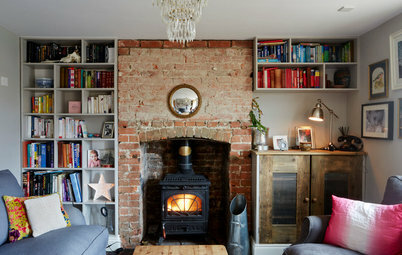 This example may be bespoke, but you could create a similar look by hanging mismatched kitchen wall units or small vintage cupboards together. Then simply paint the doors in the same bold colour and fit new, matching handles to bring the pieces together. Red is always a striking choice, but it can be harsh if you’re not careful – paired with just white it sometimes appears stark. Tone it down by adding darker neutrals. Here, the back wall is in a rich charcoal. It’s equally as dramatic and has the same depth of colour as the red vanity unit, so it supports and blends with it for a confident finish. 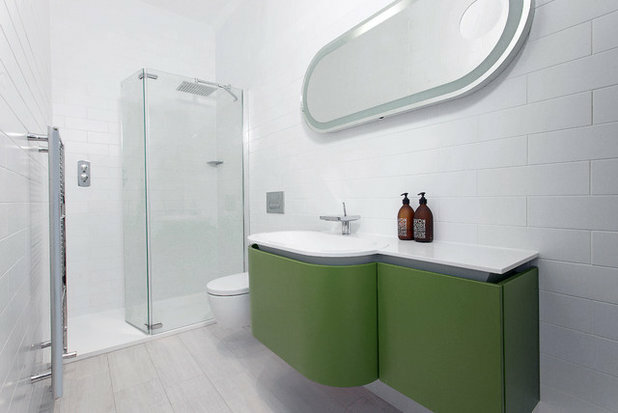 A neon shade will really wake up your bathroom. Here, the juxtaposition of an old piece of furniture with a zingy modern shade works brilliantly, with the decorative handles and vintage black marble top keeping the look on the classy side. It’s relatively easy to upcycle an old chest of drawers and turn it into a vanity unit. Paint the wood (use eggshell paint or chalk paint with a wax top coat). 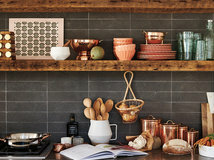 You could distress it for a vintage finish, or make any detail or decoration stand out with a touch of metallic paint. 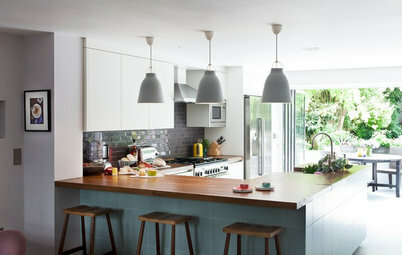 The top can be replaced with a solid surface and undercounter basin, as here. Alternatively, plumb in a bowl basin to sit on the top. Make sure the surface is well painted, oiled or varnished to protect it from water damage. 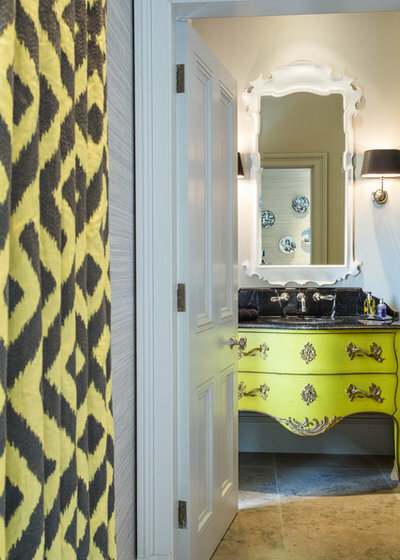 Have you used bold furniture in your bathroom? If not, are you tempted to include a colourful piece? Share your thoughts and photos in the Comments below. 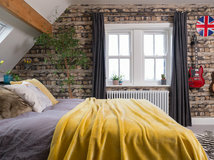 With respect always, "classy", as in "to keep it classy", is a description that has, to me, always been embarrassingly, aesthetically suspect....again, with respect to HOUZZ and to Becky Clarke's interesting, eye-catching, idea-filled post. 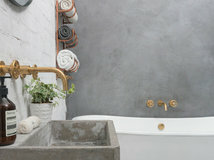 A great article about introducing some colour into the bathroom, particularly like the retro upcycled kitchen cabinet and the neon chest of drawers. Another way to add some colour would be with colourful sanitaryware. 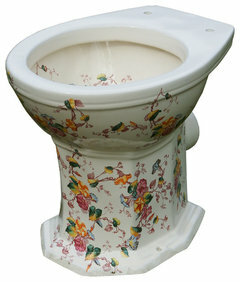 The Floral toilet pan, available from www.beautifultoilets.com is a beautifully coloured replica of an original Victorian toilet and is available at what we think is a very reasonable £550. 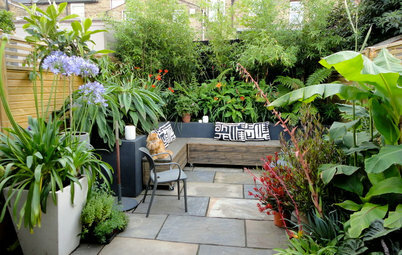 Ask a Garden Designer Ask a Garden Designer: How Can I Make My Small Garden Look Bigger? 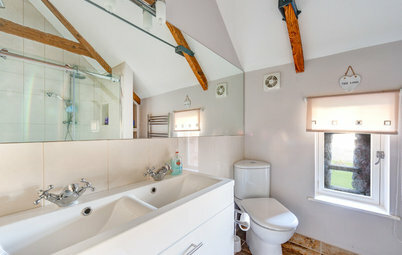 Bathroom Ideas Which is the Perfect Loo for Your Bathroom?